Swallow "Doretti" sports cars were built in the 1950s at Walsall Airport by the Swallow Coachbuilding Company (1935) Limited, part of the Helliwell Group. The story however begins in the early 1920s in Blackpool. It all began when Bill Lyons met William Walmsley who had just moved to Blackpool from Stockport. They both lived in King Edward Avenue, Blackpool and were interested in motorcycles. Bill Lyons was a motorcycle enthusiast, and William Walmsley built sidecars in his parents’ garage, and attached them to reconditioned motorcycles. Bill met William when he purchased a sidecar for his own motorcycle. He persuaded him to expand the business with himself as a partner. On 4th September, 1922 they formed the Swallow Sidecar Company, funded by financial backing from both their families and a bank overdraft. They began to produce sidecars in a 2 storey building in Bloomfield Road, with 8 employees. Space soon became a problem and two other factory buildings were acquired, one in Woodfield Road, and another in John Street. They decided to extend their product range to include car bodies, which meant that a much larger factory was essential. As luck would have it, a modern purpose-built coachbuilding factory was up for sale at 41 Cocker Street. Walmsley’s father had just sold his coal business and so decided to invest the proceeds in the building, which he purchased, and rented to Swallow for £325 a year. Late in 1926 the company vacated their other premises and moved into the building, which was ideal for their purpose. In 1927 the company name was changed to The Swallow Sidecar and Coach Building Company. One of Swallow’s suppliers was A.J.S. of Wolverhampton. A.J.S. built sidecars at Lower Walsall Street Works and sold them under the C. W. Hayward name, later changed to “Graiseley” sidecars. Swallow was one of the company’s best sidecar customers. Courtesy of the late Jim Boulton. Swallow began to purchase new Austin Seven chassis from a dealer in Bolton and fit them with a luxurious, stylish, 2-seater, open tourer body, made of aluminium on a wooden frame. The car, which made its first appearance in May 1927 was called the Austin Seven Swallow and sold for £175. It was popular, and in 1928 a 4-seater saloon was launched, along with the Morris Cowley Swallow. They soon received an order for 50 Austin Seven Swallows from P. J. Evans of Birmingham, and before the year was out, received an order for 500 from Henly's in London. In Blackpool they could only produce two a day, and there was a shortage of skilled labour, making it difficult to expand. They decided to move to an old 40,000sqft. ammunition factory at Foleshill in Coventry, where there was plenty of space, a large skilled workforce on the doorstep, and in close proximity to their suppliers, which would reduce transport costs. The move was made late in 1928 and production increased to around 50 cars a week. Although the company still made sidecars, the name was changed yet again, to the Swallow Coachbuilding Company. The following year the company extended the product range and began to build car bodies on Standard, Swift and Fiat chassis. The new models were launched at the 1929 Motor Show, including the Standard Swallow, a large saloon that sold for £245. By 1931 they also produced their own version of the Wolseley Hornet, and the Hornet Special. Bill Lyons’ ambition was to become a car manufacturer, producing complete cars. He began by arranging for the Standard Motor Company to produce a chassis to Swallow’s design, that was fitted with a Standard Engine. 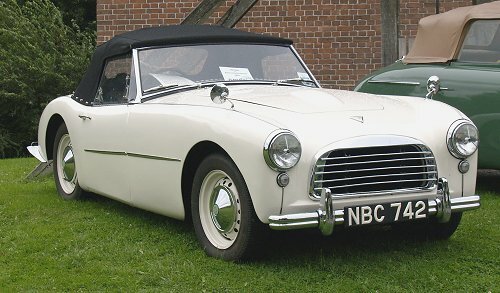 This formed the basis of the successful S.S.1 Coupé which sold for £310. Other models soon appeared including the S.S.1 Tourer. Bill wanted the company to go public, but William Walmsley would have none of it. As a result he decided to let Bill Lyons buy him out, leaving Lyons in sole charge. By the end of 1934 1,800 cars a year were leaving the factory. In 1935 Bill Lyons founded S.S. Cars Limited. He put the Swallow Coachbuilding Company into voluntary liquidation, and founded the Swallow Coachbuilding Company (1935) Limited. S.S. Cars Limited concentrated on manufacturing cars and later became Jaguar. The Swallow Coachbuilding Company (1935) Limited continued to make sidecars, and was sold to the Helliwell Group when Jaguar was formed in 1945. Angela and Trevor Davies in their immaculate "Doretti". At the 2008 Festival of Black Country Vehicles, at the Black Country Living Museum, Dudley. 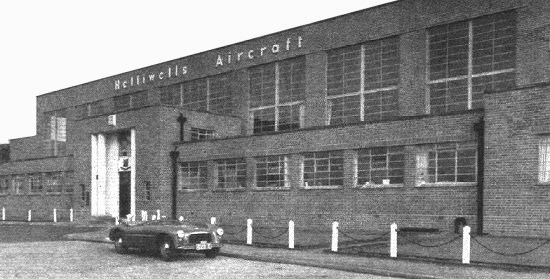 As a result of the sale, the manufacture of Swallow sidecars transferred to Helliwell’s factory at Walsall Airport, where the company manufactured aircraft components. In 1946 Swallow produced the successful "Gadabout" scooter, designed by Frank Rainbow, and in 1950 the Helliwell Group was acquired by the Tube Investments Group. 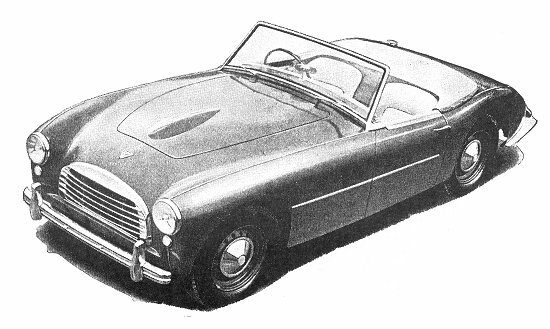 In the early 1950s thoughts turned to manufacturing a sports car, mainly for the American Market. 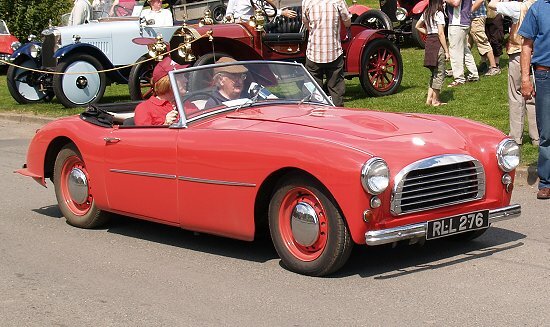 Early in 1953 Swallow’s brilliant designer Frank Rainbow was given the task of designing the car, on the understanding that the first production model had to leave the factory within 9 months. He quickly got down to work on the project and the first car arrived in Southern California in September of that year. A "Doretti" outside Helliwell's factory at Walsall Airport. From 'Flight' magazine, January 1954. 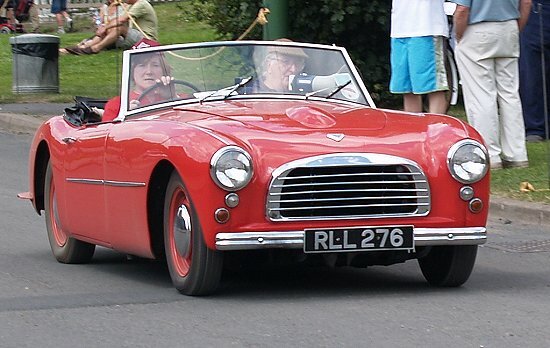 The 2-seater car is based on the Triumph TR2. 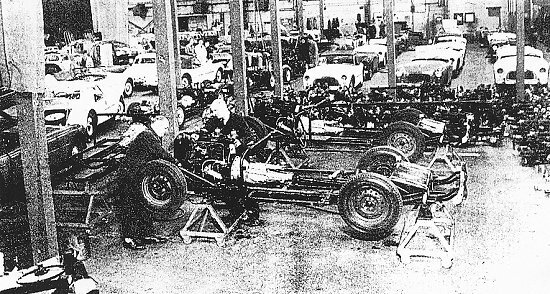 Standard Triumph agreed to supply TR2 engines, gearboxes, axles, and suspension units. The bodies were made by Panelcraft Limited, Woodgate, Birmingham. The car has a tubular steel chassis, a 2-litre engine, and a double skinned body with a steel inner shell, and alloy outer shell. 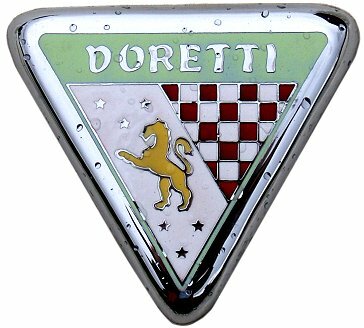 The car is called the "Doretti", an Italianised version of Dorothy, named after Dorothy Deen, the daughter, and business partner of Arthur Anderson, the importer and distributor for Swallow and Triumph in Southern California. 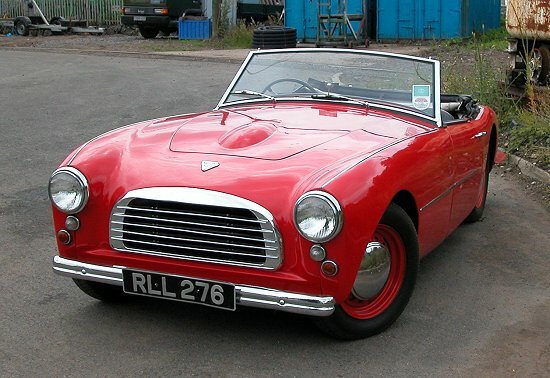 Although in competition with the TR2 the "Doretti" was more expensive, selling for £1,102 compared with £910 for a TR2. It was also heavier and so had a poorer performance, and less room for driver and passenger alike. Production lasted until 1955 during which time around 275 were built. The chassis numbers start at 1,000 and end at 1,274. Production at Walsall. From a newspaper cutting, newspaper unknown. Another view of Angela and Trevor Davies in their "Doretti". Unfortunately Sir John Black, Chairman of the Standard Triumph Motor Company was badly injured in an accident, while driving a "Doretti". Because of this the car became unpopular at his company. Production ended prematurely because of a management decision taken at Tube Investments, the parent company. Plans had been made to release a new model the Swallow "Sabre", but sadly this had to be abandoned. In 1956 the Swallow Coachbuilding Company (1935) Limited was sold to sidecar manufacturer Watsonian. 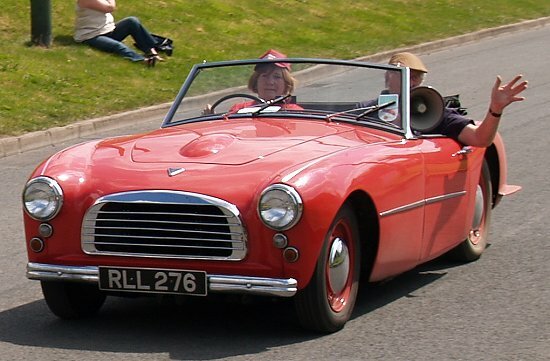 Unlike many cars, the Swallow "Doretti" has been very successful in preservation. Out of the 275 built, 184 are known to exist, 66 of them in the UK. A final view of Angela and Trevor Davies in their "Doretti". A final view of the Davies's "Doretti". At the 2006 Black Country Vehicle Rally, Black Country Living Museum, Dudley. As seen at the 2009 Festival of Black Country Vehicles at the Black Country Living Museum.